As a physical therapist, you work hard to help your patients heal. But sometimes, no matter what you do, your patient doesn’t progress. It may not be on you. While muscles may be doing exactly what you need them to do, your patients may not. 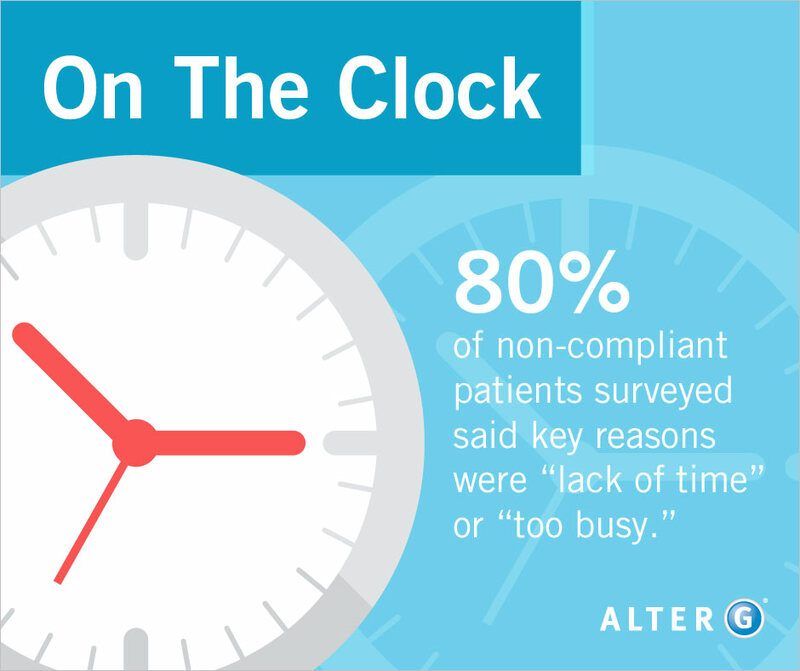 Non-compliance is an issue for every healthcare provider. Sometimes, your patients just won’t listen. Yet, it’s very rarely out of a desire not to heal or a dislike of physical therapy. Here are 3 health myths you need to know to understand the real reasons your patients are not healing. Fact: Physical therapy is just as much about mental and emotional health. An important factor in any patient’s success is the hope that they’re actually getting better. Conditions like anxiety, depression, and feelings of helplessness can hinder a patient’s progress, according to a June 2010 study in the research journal Manual Therapy. These may contribute to the idea that a patient can’t or won’t get better, sapping them of motivation. These problems are not easily solved, but pain reduction can help. One such way of reducing pain while exercising is using the AlterG Anti-Gravity Treadmill™. The AlterG uses differential air pressure to unweight patients, which means they put much less weight on their joints while still benefiting from full body movement. Less pain plus exercise often reduces anxiety or depression. You can also educate your patients on the effectiveness of exercise, and continually reassure them that they can and will heal. “I think it takes a lot of education, understanding, and partnering with patients in guiding them down a path of healing to get them invested in their treatment program,” says Karen Shuler, PT, DPT and founder of Lifestyle Physical Therapy in Lake Wylie, SC. Fact: Patients think physical therapy is important, just not more important than their other priorities. One of the things patients struggle most with is perceived barriers to exercise, according to the Manual Therapy study. One of the most common perceived barriers to treatment is time. It’s important not to view this as a patient being flippant or unmotivated. Patients may have children to take care of, a hectic work schedule, or a crazy school schedule. Fact: Stubbornness and readiness are two different things. The population Karen finds the most resistant to therapy is those who need to make major lifestyle changes, including stopping smoking or changing eating habits. Here’s the truth that you as PT sometimes have to accept: You can’t teach motivation. They either have it or they don’t. The best you can do is encourage them, recruit friends and family to assist them, and wait for the patients to come around on their own. “Typically, they come back years later because their condition worsens, and they’re ready. They’re ready for that change,” Karen says. Tools like the AlterG Anti-Gravity Treadmill can help motivate your patients to continue therapy. Learn how the AlterG has been shown to be comfortable, effective, and enjoyable for patients.